A vortex of similitude. In the eight medium size works of ink and gouache on paper, at the artist’s first show with Derek Eller Gallery, Michelle Segre merges the biomorphic and architectural. Segre’s lines render congruous blocks of cells and blocks of cement. Faces will emerge, as will castles—all with an equal weight of importance. Assumption of perspective and proportion are intentionally tortured by Segre. Bugs outsize castles. Looming eyeballs give the impression of immensity. All at once, Segre’s style is futuristic fantasy and scientific illustration. The works, with their old-fashioned precision, turrets, and suggestions of novel inner organs, harken to an indeterminate past and/or future. Always, to Segre, with her swirling currents of ink, there is an allusion which is as indicative of the physicist’s Big Bang as of the zealot’s Apocalypse. Segre’s alchemic mix of science and science fiction is bound together by a sense of awe. Echoing this is Segre’s technique, which is itself awesome. 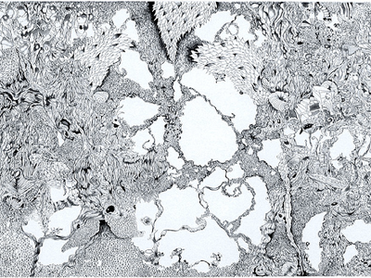 There is a mystical incomprehensibility to the minutiae and complexity of Segre’s drawings. That every ink line is permanent—no erasing, no turning back—creates an inherent momentum in the work. Segre, pressing forward without the latitude for error, forces the viewer to entrust themself utterly to her custody—despite the disturbing notion that she wants to be no more than an astoundingly accomplished doodler. Segre, by this dichotomy, allows no sense of safety in looking at her work—she will not pretend to reteach mundane philosophies. The work will not lend itself easily to discussions of surrealism, or abstraction, or figuration, etc.. And neither will it facilitate political ponderings. A child doodling enters a meditative state—and this is what Segre captures, in an infinitely more detailed and adult incarnation. Segre opens the window onto the imponderable—laughable, grotesque, and continuously churning.